After the success of promoting their 1920s drama “Boardwalk Empire” as a museum exhibit, HBO has once again turned its New York retail store into a display featuring props and costumes from one of its top shows. 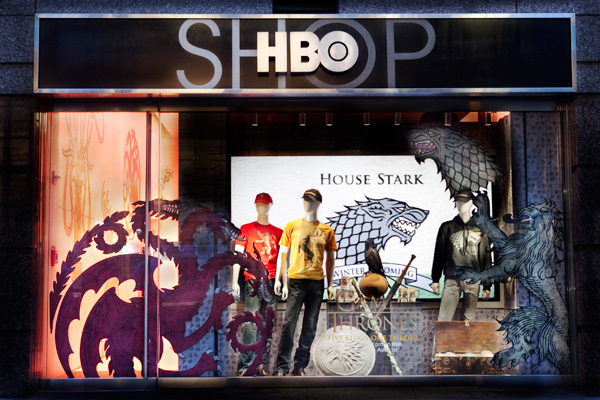 To celebrate the launch of season two of “Game of Thrones,” HBO has adorned the walls of its Sixth Avenue store with props, costumes and even a severed head from the popular fantasy series, along with promotional t-shirts, mugs, and DVD’s. Stand-out exhibits include Ned Stark’s Hand of the King pin, a horn goblet (a favorite among Northern lords), winter fell mugs, King Renley’s gorget, robe and crown, Dany’s dragon eggs, and perhaps the most shocking exhibit of all, a replica of the head of Ned Burns. In addition to the props, the exhibit also features Michele Clapton’s elaborately designed costumes. The presentation of Clapton’s designs was a strong strategic move by the network’s marketing team, who is currently planning to launch a consumer line in collaboration with Clapton. The line will include wearable pieces inspired by the show’s costumes. The exhibit was designed to give fans a behind-the-scenes look at the production of the show, as well as publicize the accompanying merchandise line.